Māori moved into the cities in large numbers following the Second World War, and a number of urban-based protest movements began to emerge from the late 1960s. One group that had a significant impact was Ngā Tamatoa (the young warriors). Its members worked on numerous projects, particularly those encouraging the revival of the Māori language. 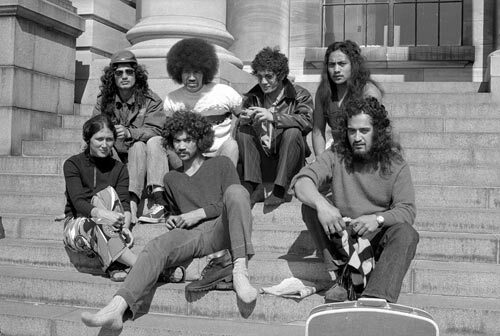 These members of Ngā Tamatoa settled in for a three-week protest in the grounds of Parliament in November 1972. They are (from back left) Toro Waaka (Ngāti Kahungunu), John Ohia (Ngāi Te Rangi, Ngāti Pūkenga), Paul Kotara (Ngāi Tahu), Tame Iti (Ngāi Tūhoe), and (from front left) Orewa Barrett-Ohia (Ngāti Maniapoto), Rawiri Paratene (Ngāpuhi) and Tiata Witehira (Ngāpuhi).